From its opening on August 18, 1915 to the sudden departure of the Boston Braves to Milwaukee just weeks before the start of the 1953 baseball season, Braves Field was home to Boston's National League baseball club. The ballpark hosted many other events, from college and NFL football to major-league soccer to championship boxing, and the facility lives on as Boston University's Nickerson Field. Many of the most memorable moments to occur in Braves Field history are portrayed here, providing a look back at a ballpark often overlooked even in Boston today. Braves Field: Memorable Moments at Boston's Lost Diamond combines the collaborative effort of 43 members of the Society for American Baseball Research (SABR), including Alan Cohen, Bob Brady, Bob Goodof, Bob LeMoine, Bob Ruzzo, Brian Davenport, C. Paul Rogers III, Cecilia Tan, Chip Greene, Dan McCloskey, David C. Southwick, Donna L. Halper, Douglas Chapman, Eric Aron, Gerald E. Beirne, Greg Erion, Gregory H. Wolf, Harvey Soolman, Herb Crehan, Jack Zerby, Jim Kaplan, Jim Prime, Joe Schuster, Joe Wancho, John Delmore, John DiFonzo, Len Levin, Lyle Spatz, Mark Pestana, Mark S. Sternman, Mike Lynch, Mike Richard, Mort Bloomberg, R.E. McMillin, Raymond Miller, Richard “Dixie” Tourangeau, Rick Schabowski, Saul Wisnia, Scott Ferkovich, Thomas Mason, Tim Goehlert, Tom Hufford, Tyler Ash, W. G. Nicholson, and Warren Corbett. E-book: Click here to download the e-book version of Braves Field: Memorable Moments at Boston's Lost Diamond for FREE from the SABR Store. Available in PDF, Kindle/MOBI and EPUB formats. 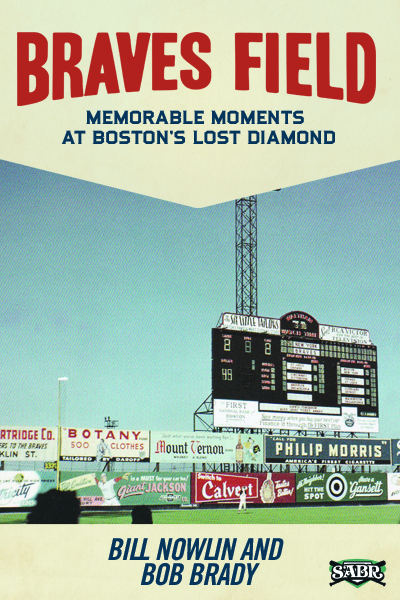 Paperback: Get a 50% discount on Braves Field: Memorable Moments at Boston's Lost Diamond paperback edition from the SABR Store ($15.99 includes shipping/tax). E-book: Click here to purchase the e-book version of Braves Field: Memorable Moments at Boston's Lost Diamond for $9.99 from the SABR Store/Amazon. Available in PDF, Kindle/MOBI and EPUB formats. Paperback: Get the paperback edition of Braves Field: Memorable Moments at Boston's Lost Diamond from the SABR Store ($30.99 includes shipping/tax). This page was last updated October 31, 2017 at 7:26 pm MST.